The plan was a loop starting in Taninges, up to Col de la Ramaz, down the other side (which I climbed last April), and back to Taninges. Good Plan! The secret of this route is to take the tiny route D307 out of Taninges and not the far busier D902. The routes run parallel for several kms on either side of a big river valley, but the D307 is far quieter. They then connect as you turn left up to Ramaz. Parts of this route are quite steep as it winds up to Le Praz de Lys ski station, with 4 straight kms averaging 10% and a short stretch at 14%. Taninges is a little above 600 metres and Ramaz is almost exactly a 1,000 metres higher. 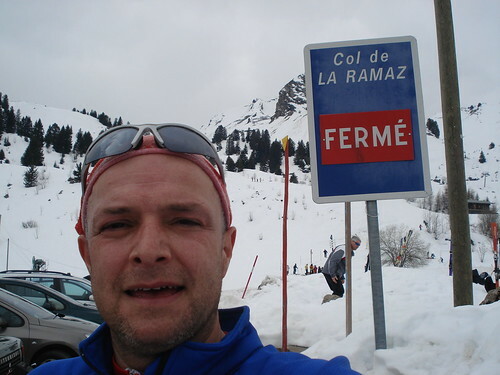 I felt fairly strong and reached the Col de la Savolière – the entrance to Le Praz de Lys – in good spirits. The little station was open and there were lots of downhill and x-country skiers. I continued through the station to attack the final 100 metres of climb when I noticed that the damn skiers were skiing on my road. The Col was CLOSED. Still, a great climb (and a freezing descent). I guess I am just a little too eager for climbing season to start.